Hi everyone, I remember years ago when I was a child, the type of Christmas jumpers that used to be around, they were completely hideous! I can remember one in particular that someone had bought for me, it was dark blue with a snowflake scene and a huge, quite creepy looking snowman in the centre. It doesn't sound that bad, but believe me it really was awful. The jumper itself wasn't very comfortable or warm and I think in the end, it didn't stay in my wardrobe very long (if you know what I mean)! Today that's all changed, it's now the 'in thing' to wear big, bright, over-the-top festive jumpers and they're available in some really nice styles too. 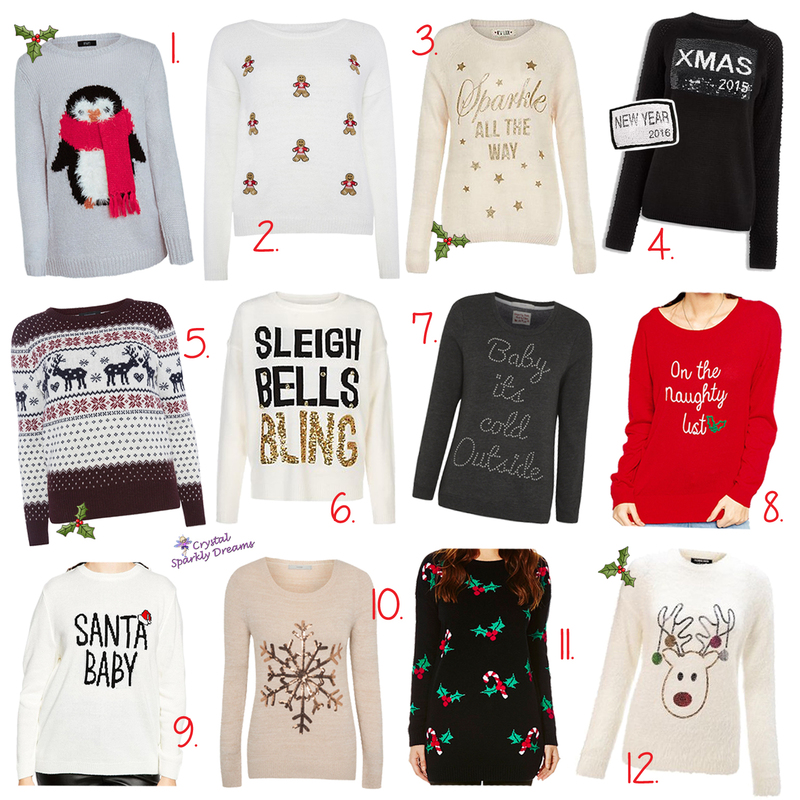 So I've spent the last few days searching the internet for, what I personally think, are the nicest and best Christmas jumpers around. I've chosen 2 from each shop and there's a nice mixture or subtle or ott ones, ranging from super affordable to ones worth spending a few extra pounds on. 1 Penguin £16. 2 Gingerbread man £14. 3 Sparkle all the way £14. 4 Xmas/New Year £30. 5 Fairisle £14. 6 Sleigh Bells Bling £12.50. 7 Babyit's cold outside £12. 8 On the naughtystep £21. 9 Santa Baby £30. 10 Giant snowflake £14. 11 Holly £18. Reindeer £20. I really like number 1 the penguin's tummy is lovely and fluffy, I think number 3 is probably my favourite one of all, number 12 looks super soft and cosy and number 4 is really cool, if you brush the sequins downwards you have the xmas image and if you brush them up it reveals a new year image too!